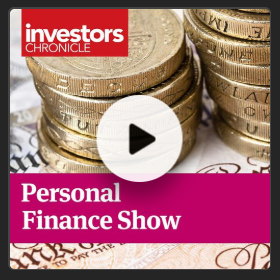 SOMETHING big is happening in the gold market right now, and nowhere is that more apparent than in central banks of emerging economies, reckons Frank Holmes at US Global Investors. Last year was a watershed in the size of official gold purchases, as central banks added an incredible 651.5 tonnes (worth some $27.7 billion) to their holdings, according to the World Gold Council (WGC). Not only is this a remarkable 74% change from 2017, but it's also the most on record going back to 1971, when President Richard Nixon brought a formal end to the gold standard. In the final quarter of 2018 alone, according to leading precious metal researchers the GFMS team at Refinitiv, central banks purchased as much as 195 tonnes, the most for any quarter so far this century. As I've shared with you before, central banks have been net buyers of the yellow metal since 2010 in an effort to diversify their reserves away from the US Dollar. Most Western nations already have a comfortable weighting in gold relative to their total reserves, so the demand is almost strictly from emerging markets (EM). Among the biggest purchasers last year were Russia, Turkey and Kazakhstan, and we also saw China add to its holdings for the first time since 2016. Meanwhile, Hungary, Poland, India and a number of other countries took deliveries for the first time this century. Other countries have a lot of catching up to do – ie, gold buying – to get to the same level. Russia, for instance, has the fifth most gold in the world at 2,066.2 tonnes, but this amount represents only 17.6% of its total reserves. In sixth place is China, whose holdings (a reported 1,842.6 tonnes) represent a very small 2.3% of reserves. Below you can see Russia's ongoing strategy of "de-Dollarization". To date, the Eastern European country has liquidated nearly its entire position in US Treasuries to fund its rotation into gold. According to the WGC, Russia bought 274.3 tonnes in 2018, its greatest amount on record, and the fourth consecutive year of purchases above 200 tonnes. Gold made even more headlines last week as it relates to Venezuela. The beleaguered South American country, as you probably know, is in the midst of a potential transfer of power, from current president and dictator Nicolas Maduro to the more centrist Juan Guaido, whom the US, European Union and other world governments have recognized as the de facto head of state. Since the US and other countries have imposed heavy sanctions on Venezuela and its oil industry, the cash-strapped country has had to rely on its gold holdings to make international bond payments, mostly to Russia and China. But the days of Maduro's plundering of Venezuela's hard currency might be numbered, and not just because he could be removed from power soon. Last week Guaido sent a letter to UK Prime Minister Theresa May and the Bank of England (BoE), urging them not to send $1.2 billion from any sale of Venezuela's gold reserves – held in the BoE's vaults – to Maduro's "illegitimate and kleptocratic regime," according to the Financial Times. "Maduro has stolen a huge quantity of state assets," including Venezuelan gold, a part of the letter reads. "There is no doubt that he will, if allowed, also steal the assets held by the Bank of England, which rightly ought to be saved to support the recovery of Venezuela." The bank has honored Guaido's request and is blocking Maduro's efforts to sell the metal. These incidents are certainly dramatic, and I'm eager to see how they play out, but I think the key takeaway is that gold is an exceptional store of value. It's the only asset of any value to which a socialist autocrat like Maduro still has access. The Bolivar is worthless, and the country's once powerful and influential oil industry is fading fast. Without gold, Maduro is powerless. As for gold prices, the rally that began late last year, when equities turned rocky, continued into the new year as the historic US government shutdown gripped investors, and signs that Fed Chair Jerome Powell was set to pause monetary tightening intensified. 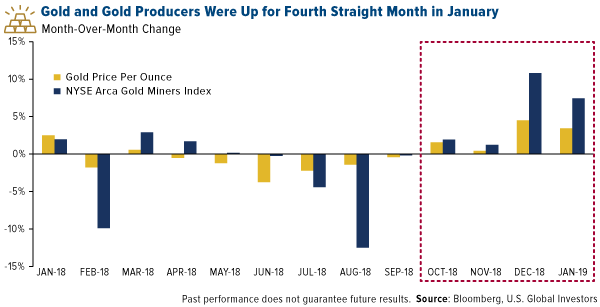 For the fourth straight month in January, both the price of gold and gold mining stocks posted strong gains. Before then, the price of gold was down for six straight months, a losing streak we hadn't seen in 30 years, when the yellow metal fell each month from December 1988 to May 1989. The yellow metal ended last month at a nine-month high, and with the US Dollar expected to lose momentum on higher deficit spending, we could see prices surge to as high as $1400 or even $1500 an ounce this year. I'm not alone in my bullishness. Billionaire Sam Zell, creator of the real estate investment trust (REIT), bought gold for the first time in his life, citing the fact that supply is shrinking. And Mad Money's Jim Cramer also came out strongly in favor of the yellow metal last week. 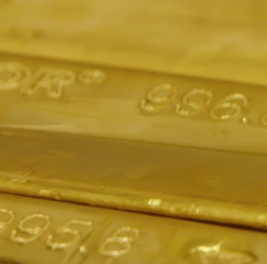 "We are big gold believers here," Cramer commented. 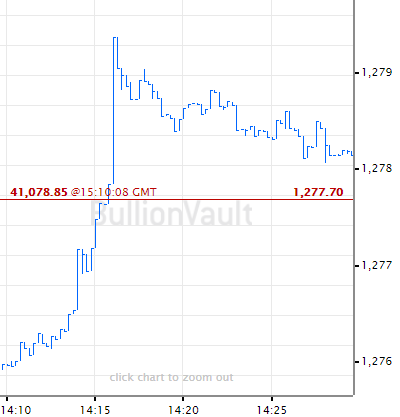 "Now gold is at $1300, we think gold is going to $1400, $1500. 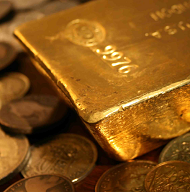 We suggest that everybody have a little bit of gold in their portfolio." I second Cramer's suggestion. My recommendation has always been a 10% weighting in gold, with 5% in bullion and jewelry, the other 5% in high-quality gold mining stocks and well managed gold mutual funds and ETFs.